Penny Drop is a little something we're putting together. It's a timing based puzzle game for mobile about collecting pennies. Journey through neato zones and overcome the challenges they throw at you in pursuit of precious coins. After countless attempts at working on sillily ambitious things that we pour tonnes of passion into only for them to fizzle out within weeks, we've finally decided to focus on doing something achievable (creating a devlog is a little bit of a tether to that end, a lil bit of accountability). The "We" here is me (hello) and Malloy. There's a fairly hefty amount of pre-production done, but we're just a couple of days into actual active development at the moment. The plan is to get the gameplay together and make sure that's all as fun as can be, then dedicate time into piling on the details and then piling on some more, hopefully cramming in as many penny jokes and phrases as possible along the way. I'm gonna cap it off here and keep this post quite brief, before diving off into more specific details in following posts. Since I've only shown basic gameplay here, I'll post about the menu and flesh out that mention of zones in the next update. I like the idea and the simple art-style. While we get on with getting something workable together I'll plumb the depths of our mock ups and designs to shed a bit more light on everything. Let's kick it off with some gifs (I have a lot because I get carried away and make too many). The penny'll travel down the menu like it's being dropped through each level, descending toward (but never reaching?) the piggy bank (that's the story for the lorefans). We want to keep everything clean and simple, so the game'll only really consist of two main parts, the in-game screen and the menu which'll be a hub for everything else. In the past we've had menus with tons of buttons and tabs, which had their place due to the nature of the projects but this time round there's no need for too much clutter. All additional menus will be nestled within the main menu hub. The settings button for example will just provoke a pop-up as above. It's been pretty fun approaching a simpler idea like this and figuring out how to keep everything stylish and clean, how to make pop ups readable etc. I mentioned zones in the opening post and totally spoiled it with the settings gif but hey ho: Zones will be sets of levels that introduce new mechanics to game. Visually speaking they'll only really make a big difference to the menu because we want to maintain a standard/ uniform appearance in-game. The influence of zones on gameplay will be through the introduction of new tiles with new mechanics. There'll be a batch of levels per zone (at the moment we're aiming for 20 before testing to see if that's a good idea), that're gonna need clearing before moving through to the next zone. They'll be linear so we can introduce mechanics at a certain pace and design levels around expectations of player understanding. 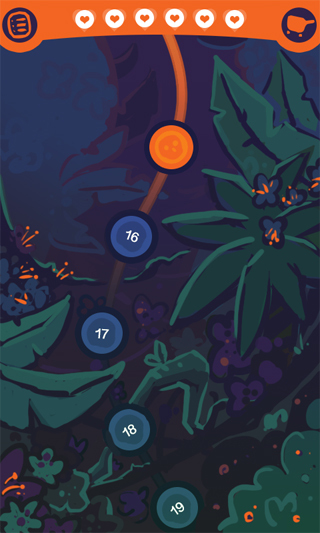 To give an example, the Jungle zone will transform the menu into a deep overgrown mess, and introduce Stickyboxes to the game; stickyboxes are sticky boxes that the Penny sticks to. They serve to pause the flow of gameplay and maintain a need for player input. They're both helpful and disruptive depending on situation. Seeing as how I've jumped ahead of myself and probably failed to actually explain the core gameplay with any clarity, I'll make the next post about the core idea of the game before showing off other ideas for zones and delving into further mechanics. Looks like a small, managable, Peggle-like game that you can keep in scope nicely. As you say, it's achievable! And it's already looking quite polished. I have to say that neither "Penny Drop" and "A Game About Dropping Pennies" sound terribly interesting, my hopes weren't terribly high when I clicked through to the devlog given that title. Of all the many objects (or animals) that could be getting dropped into something else, why pennies? Cheers rj, tuba and pixel! @Cranktrain, have you heard the expression 'the penny drops?'? The game was Eluardian's core idea and I believe it was inspired by that expression to understand a situation at hand which led to this lil puzzle game design. We'll try our best to make the context of pennies more exciting xD. Indeed I have! But I'm sure you see my point that a game wherein you drop literal pennies doesn't sound terribly exciting. It certainly looks excellent so far, I had just wondered whether you had considered any other themes for the mechanic that might more readily arrest people's attention? Thank you everybody for following along and saying sweet things! Penny Drop is a timing based puzzle game (timing is a huge aspect and I'm going to update the opening post so nobody will ever know I failed to mention it). It's all about making sure you time your drops perfectly so that the penny is guided through the puzzles and effortlessly glides into the slot at the bottom. The slot will always be moving, hence the inherent need for timing. For example, in the gif I posted, the player needs to set up the box to send the penny into the portal, and then release the penny at the right time so that it will exit the portal at the correct moment for it to fall down into the slot as it moves beneath it. We'll use a system of regenerating lives, with failure to complete a level resulting in the loss of 1 life; completing a level doesn't cost a life. We don't want the life regen to be punishingly slow and therefore boring (and sometimes annoying) as it can often be, and we're looking to set it up in a way that doesn't make it feel like you get one play session then you're done for the day, rather you're able to regularly return to a fully stocked life counter after draining all your lives then taking a break. Things should feel fair not punitive. For each level played, the player will have 3 chances at success. That is, they will have a set of 3 pennies to drop. If players complete the level with the first penny, they'll receive a top score and their level indicator in the menu will change to show a gold penny. Completing the level with the second penny (maybe dropping the first to get a feel for the level, then more confidently dropping the second) will do the same but with silver. A completion with the third penny results in bronze. Messing up and not getting any of your three pennies into the slot is no good, and you'll fail to complete the level and lose the life you're on. There'll be an in-game timer that ticks down to zero. Whether this countdown begins on the first interaction with the level, first drop of a penny or just as the level is loaded up is TBC. But we've gone with the timer to add an urgency to play. Not completing a level within the countdown will result in the loss of a life. However, we'll need to account for things like it maybe ending up being necessary to wait a short time for everything to line up for you once you've figured the level out and are ready to drop, so this is a value that will need to be monitored and tweaked heavily so it's not unfair or just silly. The time limit is likely to be unique to each level, as some will just need to be longer due to the penny maybe being in transit more, the need to wait for things to line up, levels being innately more difficult to solve etc. So all in all the game is tied to dropping pennies into a moving coin-slot under these ties: Lives, Pennies and Time. I'm hoping that this, combined with all the gifs and things are enough to have painted a good idea of the game, so we can go ahead and cover the mechanics that'll feed into this framework. If not and there are things that remain unclear or whatever else then please, please, please ask away. Thanks a ton for all the kind words! I appreciate the questions. Maybe it's something like the result of being blinded by viewing it from the inside, but I hadn't really considered the concept might be so bland as to actually be off putting. I suppose it's not so much a lack of consideration toward widening the search to find an idea that's more grandiose or appealing out of the gate, but instead it is the sort of uninteresting nature of the idea that is kind of the appeal to me. I thought while it's this mundane thing, as I pushed the idea to see if it was worth pursuing I saw what I believe is room for depth, and that's been an interesting process. Similar to the game itself in terms of up-front simplicity belying depth (hopefully), I believe that Penny Drop, centred around pennies, can have a personality and I'm actually enjoying piecing that personality together too much to want to change it to something else. I hope that at least kind of explains what we're going for here, and fingers and toes crossed that your worries melt away with each update. Heyo, just a little update. We've been focusing on getting the game set up with all its mechanics working, so I've been going through and creating some art for each piece. The phasebox above was the start of that, and I kind of wish I'd saved it for this post but I was running on hype so it's alright I guess. There are more mechanics but they're either a lil more mundane or not yet figured out. A couple are more challenging than the others to get figured out. 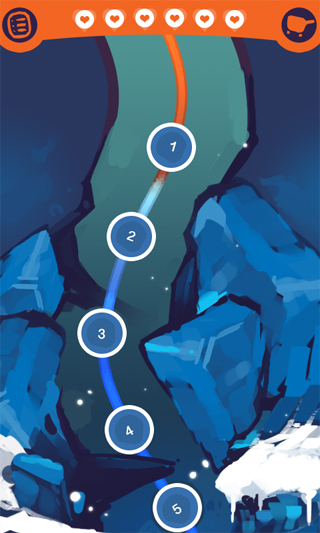 We're gonna be getting the gameplay sorted before moving onto the menu, so we've generally focused on in-game art, but that didn't stop me getting carried away and mocking up a lil ranks idea. Anyway yeah just a super short one in comparison to the last couple posts. Thanks for checking it out! Hopefully we'll get some in-editor stuff posted soon. Damn, this is actually looking pretty sleek. Really like the art style and how clean everything looks. Long time no update! We've both been a lil pre-occupied with day jobs, and I've also been watching Stranger Things. Things are still moving along though, it's just been a little too mundane to post about as frequently. Successful and failed collection are being recognised with a reaction. We've got phaseboxes (the ghost ones), directors (the green ones), roundabouts (the spinny blue ones), stickyboxes (the pink (obsolete art) and yellow-y ones), portals (the portal ones) and we did have speedboxes working too but after creating them and playing around with them, they're changing. The mechanics hopefully are self explanatory through seeing them in action up there (that's the way we're hoping to introduce them, through simple interactions rather than tutorials or explanations). There are just a couple of other mechanics to flesh out which are icepaths and the updated speedboxes, which'll become speedways. We left these till the end because they're not just blocks like the others. Speedways will essentially be the speed up equivalent. They'll probably look similar to the initial tile, but they've yet to get a redesign. So those two things are next on the agenda; we're just focusing on getting the gameplay mvp set up. Then some menus. There is one other mechanic but we'll save that for a while -- not because it's a teaser or a shameless attempt at a "Tune in next time for...", but because we're not totally done figuring out if it's neat or not. Hallo! Not so much an update, rather a question this time round. As a way of incentivising people to return, we're putting a daily giveaway sorta thing in. We went with it because it ties into the penny theme (people'll tend to use small change to scratch away the scratchy film of the card), and because they're a pretty satisfying experience by themselves. They've got a sort of addictive mysteriousness and it's super gratifying finding out if or what you've won (though you'll always win something with our scratch cards). We were wondering though, after talking with a friend not from the UK who was unfamiliar with scratch cards, if they're basically a UK only thing? So the question, to anybody who's read this far is: Are scratch cards a thing where you live? Is the concept recognisable? Good concept - and yes, I think it's recognizable. It struck me as a sort of lottery ticket. Either way, it's a definite incentive for at least logging in every day. Ah, the first piggy gifs (snicker) got me really interested in this. The colors and style really give it a relaxed feeling, yet at the same time the goal keeps you on your toes. In Finland we had this coin operated game, where you had to try to shoot the coin in the correct hole using just one finger (adjusting the power and direction you hit the "switch" from). It was really popular and I think there are annual competitions still happening , so this kind of has that same appeal, but much more. We use scratch cards quite much, so yeah, works here as well. I only realised that there was a follow up to 'Indie Game: The Movie' two days ago and upon watching it (Life After), there was something that Tommy said that just resonated with me regarding gameplay feedback and if that feedback bugs you... Well up until now, where in my mind the core gameplay mechanics were pretty much almost finished, the penny would stall for a couple of frames upon colliding with a gameplay object and then update information...E.g new vector, new velocity update information etc...When testing this, that minor delay between the collision and the desired result bugged the hell out of me. Soooo I went back and changed the way that information updates and it broke like the majority of my currently working mechanics but for what its worth, on the gameplay objects that I now have it working on, the gameplay is far more responsive, the delay isn't going to frustrate players anymore (let alone myself) and breaking it was worth it Hopefully a 1 step backwards, 2 step forwards type of deal! Much more efficient and responsive!